YAY for another warm week this coming week. There is no rain in the forecast this coming week. We are also heading out camping this coming Saturday for 2 weeks. No cancelling this time. I can't. We have a friend and her family living in our home for the 2 weeks we are camping. 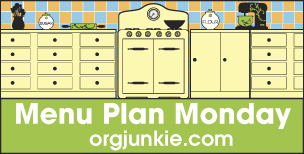 Your menu plan looks great! Hope you have a great week!